I haven’t looked at ‘doc’ copper in a while, but a bullish note posted by Seees37 in the Saloon made me curious about the long-term chart. It is indeed bullish and has been so since 2016, mainly because of the robust impulse legs that have been occurring regularly since. Every major upthrust has exceeded a significant prior peak, and that is usually a good indication that the trend will continue. There have been some minor, bearish impulse legs along the way, but none as strong as the bullish ones. 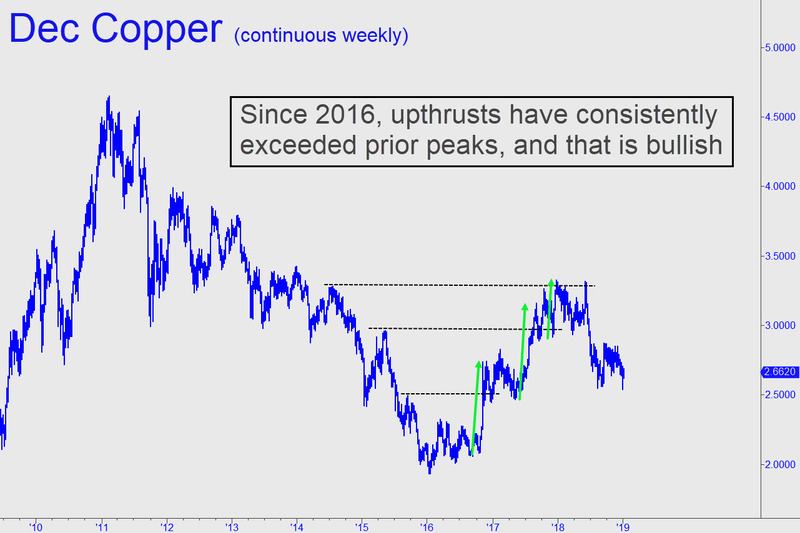 If copper prices are in fact headed higher, that would imply the economies of China and Germany are about to get second wind and that recession talk in the U.S. is premature. This is far from a given, however, since it wouldn’t take much weakness to diminish the bullish look of the weekly chart shown. A dip beneath 2017’s lows near $2.45/pound would suffice. That would also crystallize the bearish head-and-shoulders pattern that has traced out since late 2016. I usually don’t pay much attention to these formations because they are everywhere one wants to see them. In this case, however, the pattern is such a textbook beauty that we ought not ignore it. For an illuminating discussion of head-and-shoulder patterns, visit the Coffee House and Saloon, where some subscribers have weighed in most insightfully Sunday morning on the topic. _______ UPDATE (Jan 28, 4:28 p.m. ET): The recent thrust pushed above three prior peaks (click here for chart), suggesting that any weakness will be corrective, prelude to another bull leg.